Falling is a very common and serious problem for older persons. All too often, falling results in injuries such as broken bones and cuts, and the need for hospital care and/or nursing home admission. Both the incidence of falling and the severity of fall-related complications rise steadily after about age 60. Many times, falling can be prevented by relatively simple interventions, such as adjusting the dose of your medication(s), getting new eyeglasses or modifying your home environment. 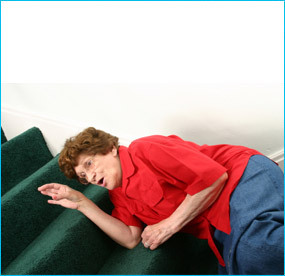 Falls occur frequently and are a major cause of disability and death in senior citizens. More than one third of people over the age of 65 have at least one fall each year. Injuries sustained in a fall may range from trivial bruises to life-threatening trauma. Head injuries and fractures of long bones (for example, hip fractures) lead the list. It is important to realize there may be a delay in the onset of the effects of head injury. Even falls that do not lead to injury can have a negative effect on older adults. After a fall, elderly patients often voluntarily restrict their activity because they fear another fall. This reduction in exercise leads to further weakness that, in turn, increases the risk of another fall — a vicious cycle. At Columbus Center for Medical Rehabilitation, we create a customized treatment program based upon an evaluation performed by a Physical Therapist and Occupational Therapist, taking into consideration the individual’s diagnosis, medical history, and diagnostic test results.